The building is nestled within an idyllic heartland in peaceful green surroundings at Gobindapur, just 4 Km short of Baruipur, 6 Km from Narendrapur and thus close to the main city yet away from the heat and dust and noise. The place is approachable through Garia Main Road taking about 25 minutes when you drive from Garia crossing or 45 minutes from Ruby Hospital on EM bypass. However, the new Southern bypass which is under construction for connecting the EM bypass to Baruipur will pass very close to the home and will bring down the drive-down time by nearly 15 minutes. A bypass express highway from Kamalgazi directly to Baruipur has cut down the journey time by 25 minutes. 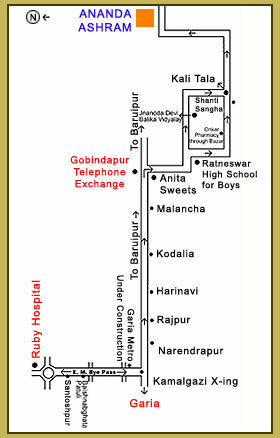 Anyone can reach Ananda Ashram from Rubi Crossing within 35 minutes. Baruipur has now become the district headquarters for South 24 Parganas district and commercial and business activities around the region, that has increase manifold. Residents/Boarders can now approach Kolkata very easily within a much shorter time.